For example, imagine the newly minted vegetarian who craves a hamburger (this is analogy is based on a real story, stay with me). "Brunhilda" recently became a vegetarian for ethical and dietary reasons, but failed to integrate enough compound proteins back into her diet, living on vegetables, fruits and grains. Brunhilda lost the weight she wanted to lose and her skin and body looked and felt great for about two months. On an energetic level Brunhilda was quite ungrounded, she was frequently spacey and impersonally detached from her emotions and body so much so she ran into things in her surroundings due to a relative unawareness of the physical world. Her ungroundedness worsened as she continued her vegetarian diet and she began to have fainting spells and increasingly feeling more low-energy, depressed and "unreachable". She tried integrating soy and other protein sources but that hamburger craving would not subsist (even with tasty black-bean burgers). After learning that some people's energetic systems need meat to "ground" them (preferably organic, sustainable meat because it is of a higher frequency), she returned to eating meat once a week simply because she couldn't sustain the lightness of a purely vegetarian diet. She felt happier, more grounded and less spaced out. I am similar in that if I don't eat meat for extended amounts of time I feel sick and weak, whereas Aaron prefers not to eat meat frequently because she often feels weighted down by it. It just goes to show that sometimes the ideology we hold about nutrition and exercise doesn't always match the reality of our energetic or physical experience. Being physically healthy is about honoring our body's intuitive wisdom. If you never eat a candy bar and you want a candy bar, it's probably a good idea to indulge that (exercising common sense and moderation). Okay, you may ask "what If you're diabetic and you want a candy bar". Well your body has already told you to be careful of your sugar intake so does this mean don't eat a candy bar? Not necessarily, it means filter out your imbalanced desire from your bodies authentic messages. Find an alternative, or eat a candy bar once a week and take your blood sugar accordingly. If you're pissy that you can't ever eat a candy bar and a "fandy" bar doesn't do it (fandy bar=fake candy bar) then your friends and family will probably thank you for honoring your desire. If you normally work out for 3 hours a day and today you feel like you might just stab yourself in the gullet if you had to go that long: do something else! The tedium of your workout may be working against your goals (this is how I feel everytime I do a plyometric workout, which means I probably need a replacement, and Aaron would probably thank me for not flopping around the living room awkwardly for 55 minutes while she's working). There's a difference between feeling intimidated by the intensity of the workout and feeling bored by it. Intensity or challenging yourself is good, but even then we must listen to what is right for our bodies in the moment. Holistic balance in our lives is about managing our desires, needs, bodies and emotions. It's a constant struggle and virtually nobody is perfect at it. We aren't meant to be, we would be dead otherwise. Bodies have a multitude ways of talking to us, ranging from cravings, to minor aches and pains, tingles and rashes, and everything in between. Sometimes the message is physical other times it's emotional. It's worth it to engage in the conversation. 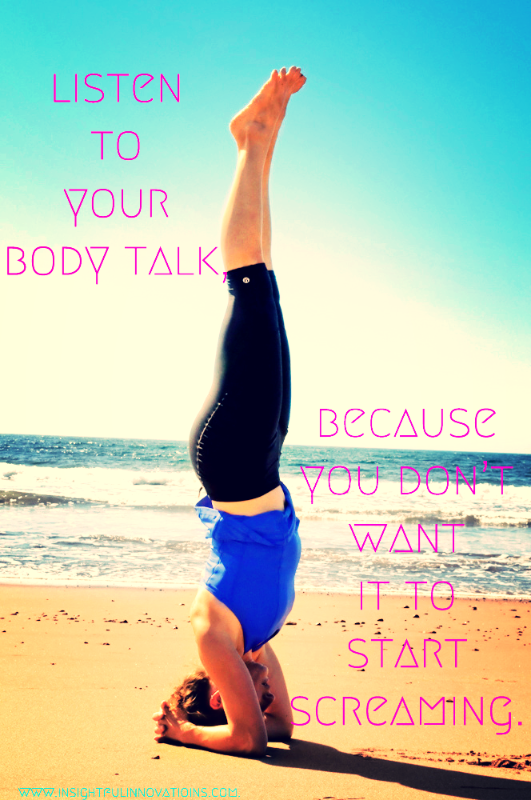 Listen to your body talk, because you don't want it to start screaming.